The country of Australia wears many hats. From its picturesque beaches to the open landscapes of desert and starry skies, Australia has been on many a traveler’s bucket list. In today’s 60-Second Geography, we’ll be looking at the Northern Territory of Australia. Here travelers will find the witness the magic of untamed natural beauty. Thanks to AAT Kings, which offers up some of the best vacation tours and packages in all of Australia. The largest city in the Northern Territory is Darwin, which sits on the coast of the Timor Sea, was named after Charles Darwin as the ship he sailed on docked there. Being the closest city to South East Asia, it is the major hub for travel to Bali and other islands in the area. The traveler will find a cosmopolitan city with more than 50 nationalities that contribute to the culture. This shows itself in the abundance of Asian-style markets, along with Aboriginal artists that keep a deep history of their people alive. Just like the historical figure the city is named after; the traveler will find an interesting city to explore with beaches and variety. 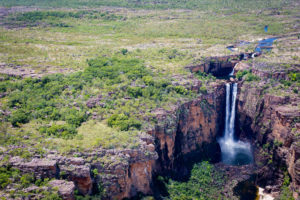 Southeast of Darwin, and about half the size of Switzerland, is the Kakadu National Park. The home of Aboriginal people for almost 40,000 years, Kakadu is a wonder to wander through. The park is a wetland area, with high-rising rock formations and a plethora of species to see. 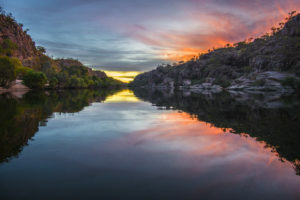 With four major river systems and six major landforms, the landscape itself is alive with diversity such as lowlands, basins, tidal flats, and stone hills that suddenly jut from the flat earth around it. Kakadu is chock full of species to watch, including: wallaroos, wallabies, storks, crocodiles, bats, and kangaroos. To top it off, the traveler can find ancient Aboriginal artwork on the rocks of the Ubirr. Off the coast of the Northern Territory is the Tiwi Islands, which consists of Melville Island and Bathurst island—along with nine uninhabited islands. The two main islands are home to about 3,000 Tiwi people. Known for their indigenous artworks of intricate wood carving and Batik-style fabric painting, they preserve the old ways through their creativity. The traveler can go visit three art centres (Tiwi Design, Munupi Arts & Crafts, and Jilamara Arts and Crafts) to check out the beauty of their art. Though tourism is limited to organized to organized tours to the islands, the traveler will still enjoy their time with the indigenous Australian people and their arts. Uluru, also known as Ayers Rock, is located in Uluru-Kata Tjuta National Park in the southern part of the Northern Territory. This rock formation in the middle of Australia is an iconic sight, and also a UNESCO World Heritage Site. This massive, domed rock formation is considered sacred by the Aborigines and owned by the Anagu. It’s actually a large boulder that rises out of the surrounding plain at 1142 feet and sits almost 3 miles below the surface. Though climbing the rock is discouraged by the indigenous people, the traveler can choose to walk the chained paths that trek up the formation for a phenomenal view of the surrounding area. Here, also, the traveler will find a compass plate at the top to get oriented with wilderness around them. 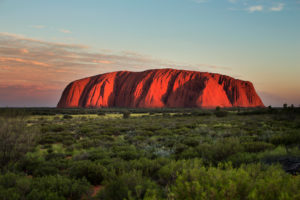 Uluru is a daytrip, as no accommodations are found on site for an overnight stay. The Northern Territory of Australia is a unique getaway that has a diverse range of sites and activities. And AAT Kings wants to show the traveler the best of what the Northern Territory has to offer. With tours that take the traveler to multicultural cities and ancient lands full of natural beauty—AAT Kings has the traveler covered.